16-year-old Emma (centre) spoke at the Australian Embassy in Laos. Photos: Supplied. For a 16-year-old footballer growing up in the nation’s capital, Emma Ilijoski has achieved more than most in her young years. Even she admits she pinches herself to prove she is not dreaming. 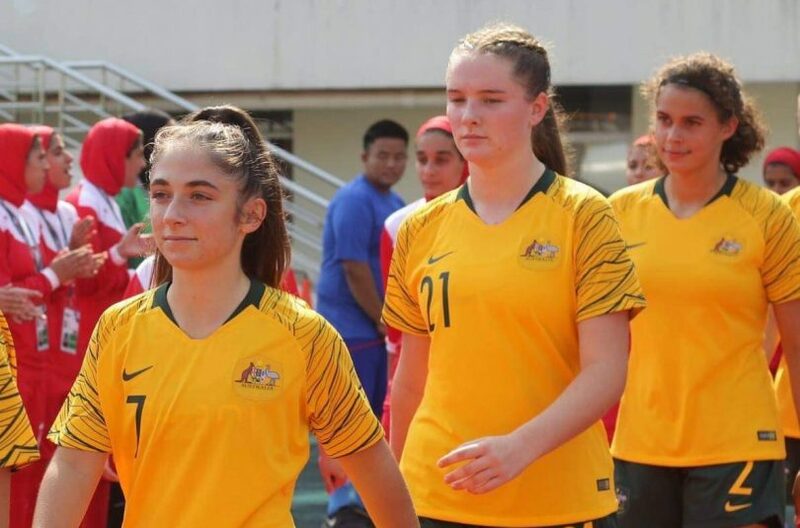 The Junior Matildas leftback recently returned home from a trip to Laos to play in the AFC U16s Women’s Championship, where the side won three out of three games. The side topped the group by defeating Iran, Vietnam and the home nation, but it was Ilijoski’s actions off the field that was most impressive. 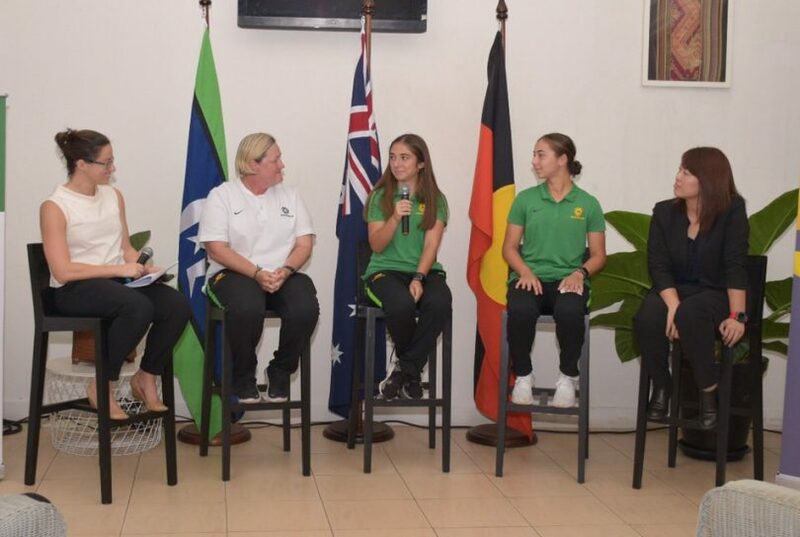 As part of the Junior Matildas’ leadership group, Ilijoski was given the chance to talk at the Australian Embassy in Laos about women in youth sport, highlighting the role of sport in promoting gender equality. Speaking alongside head coach Rae Dower and the Head of International Relations of the Laos Football Federation, Keo Phawadee, the panel shared their experiences of sport building relationships between countries and promoting equal opportunities for women and girls. In a room filled with the representatives from the Ministry of Education and Sport, the Lao Football Federation, the Lao Women’s Business Association and the Lao ‘Male Champions of Change’, Ilijoski shared her experiences back home in Canberra. “We spoke about women and youth in sport and how that can have an impact on the world,” she shared. “The Australian Embassy is doing some really amazing things in Laos so to be able to talk about our experiences was incredible. The promising left-back speaks like a woman beyond her years. Maybe the real surprise about Ilijoski is that she only started playing football eight years ago, after watching her brother from the sideline. Now Ilijoski is mixing it with the boys, playing in the fast pace NPLY 16’s boys to give herself a fresh challenge this season. “There are a couple of other girls in the competition, but I am the only one in my team,” she said. “It’s a lot faster and more of a challenge, taking nothing away from the girls. “I thought about doing it last year and when I spoke to the Junior Matildas coaching staff they also thought it was a good idea. 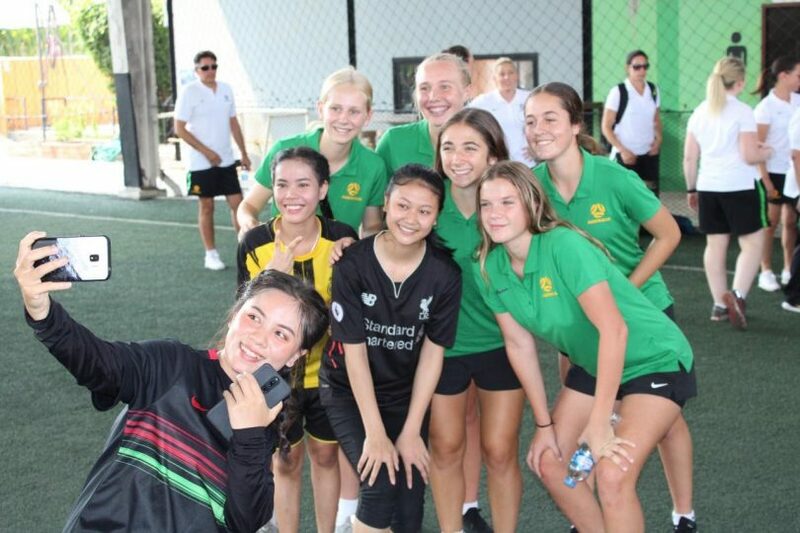 The Junior Matildas also ran skills clinics for the locals. The u16 side will now head to Thailand in September for the Asian Cup, which will also double as a qualifier for the U17s women’s World Cup in India next year. The only way the young footballer can describe the whirlwind past few months is “amazing”. “There is really no other words to describe how incredible it is,” she said laughing. “I still can’t believe I have been on tour and that I can travel to Laos and Kyrgyzstan and hopefully Thailand and India. “If it wasn’t for my family, my club, the Junior Matilda’s coaching staff and my amazing teammates, I wouldn’t have been given the opportunity to speak at the embassy, to travel and to play football. Yay!! This is amazing!! Well done Emma! Andrew Williamson more Canberra/Laos connections.